What useful contribution have you made Germaine? Oh, you've bought up your own private bit of rainforest, for your occasional visit… how admirable. Better that our kids turn into a get out there and do something bloke like Irwin than a bitter old bag like Greer. (How much did she write about him whilst he was alive to defend himself I wonder?) She sickens and disgusts me. 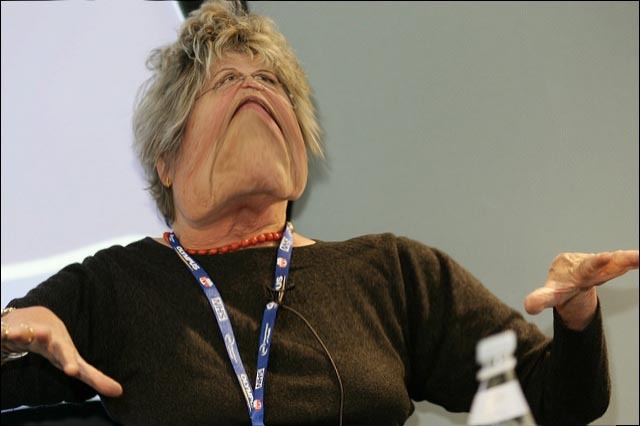 Germaine is pictured demonstrating the final stage of her thought process; specifically how to extract her suppository shaped head from an uncomfortable spot. Tags: Fallacy, Steve Irwin, Germaine Greer, LAME.